If you love history, especially English history, and you have a little spare cash to invest, then you might consider this a great opportunity .... a 600 year old, English, medieval castle (or at least its ruins) is now for sale. A price tag of £1.5 million (approx US$3 million) might be a little offputting but buying tangible history doesn't come cheap. 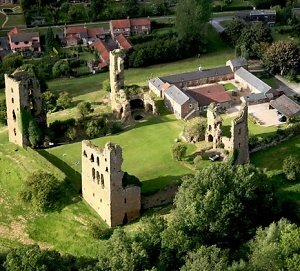 Sheriff Hutton Castle, 10 miles from the wonderful, historic city of York in the North of England (UK) can boast a pretty impressive list of 'previous owners: King Richard III, King Henry VIII and Queen Elizabeth I of England to name just three of the eight monarchs who've owned it. The castle was built in the late medieval period (1408) by the Neville family - once one of the most powerful families in Britain and famously associated with other medieval castles such as Raby Castle - but on the death of Richard Neville it was confiscated by the Crown in 1471, thereafter being owned by the aforementioned monarchs. This is only the 3rd time in the castle's 600 year history that it has been up for sale so it's a rare opportunity. Included in the price tag are a 4 bedroom barn conversion, 2 bedroom cottage plus 11 acres and "the footprint of an important Elizabethan water garden". The castle is also reputed to be haunted! Nothing new for a medieval castle - see our list of Haunted Castles. Oh, and if you do buy the castle after reading this article, don't forget who tipped you off. We'd love an exclusive interview!